Civilians may seem to know or grasp an idea of an active duty military personnel’s life, but many do not know the depth of it. It’s a different process from deciding on enlisting to the process of enlisting, then it’s time to leave home for Boot Camp. Determining a specific job as well as a duty station for the current time given also comes with the territory. Being active duty in the military is unpredictable because there are a lot of circumstances that are encountered on a daily basis. 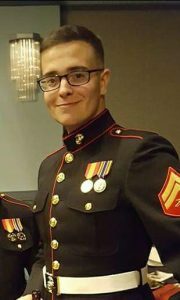 Michael Buchheit, 22, is an active duty Marine from Missouri, currently on his third year. Buchheit began in San Diego for Boot Camp, went to Twentynine Palms for his MOS, which is a nine-digit code for a particular job. He is currently stationed in New River, N.C.
Buchheit debated between the U.S. Air Force or U.S. Marines and ultimately chose the Devil dogs, most importantly because his father was a Marine. “I chose the Marines because of all the branches. We are those who stand above the rest for we hold ourselves to a higher standard,” stated Buchheit. There are reasons many enlist, whether it is financial issues or education opportunities. “I grew up idolizing the military and joining the men and women that I highly respected so it was an honor that I wanted to be a part of,” explained Buchheit. Before enlisting, Buchheit didn’t visualize or prepare for the military life, rather he was more focused on preparing for boot camp prior to anything. He had no idea what he would be doing careerwise. Anyone who is interested in enlisting must seek the recruiting center, then will endure questioning from the recruiter(s). Next, a date is scheduled for Military Entrance Processing Center (MEPs). MEPs require individuals to take the Armed Services Vocational Aptitude Battery test to determine the eligibility of a job. After you take a physical and once the ASVAB is passed, the individual can select a job they want to partake in for the next few years. The subject swears in, then is scheduled and set for boot camp. As for Buchheit, his MOS is 2841 Ground Radio Maintenance. He says that life has been busy in the military. “There is always work to be done to ensure your unit is mission-ready on top of making sure you are physically and mentally fit,” said Buchheit. Throughout the years of active duty for Buchheit he has learned America is changing. “There are fewer and fewer people who are willing to work for what they want [in regards to pursuing their passion]”. One thing that he finds difficult is staying in communication with his loved ones. Buchheit stresses that it can be difficult being active duty for those considering enlisting. “Make sure that this is what you want. If you are not dedicated to being part of the military, then you will only be more miserable while under contract,” stated Buchheit.